The other day, I noticed a ladybug in my garden. It was sitting on one of my roses. I have always thought that the ladybug was special, and that it comes to us with a message. It teaches us not to fear and return to love. There is a story of how the ladybug is named after Our Lady. This tiny little beetle sends us a powerful message. When it appears in our life, it is telling us to "let go and let God." The ladybug, with its hard red shell and black spots brings a feeling of joy to us. Oh Sherri, I love sweet lady bugs! I've not seen one is a very long time. I do want to see one, love that it means "be still and trust God." That is so special! Thanks for sharing this wonderful message today. What a beautiful message, Sheri! I haven't seen a ladybug in the last month or so. They are wonderful in the garden as they eat aphids. Some gardeners buy them in bulk and release them in the garden. Lovely picture and thoughts about the ladybug ... I haven't seen one recently, I must look harder. Ladybugs always make me smile. I have always like lady bugs, they are good for the gardens too, as they eat aphids. My granddaughters enjoy watching them walk on leaves and then watching them sail away into the clear blue skies. Such a sweet symbol of trusting in God. Sheri I spotted a ladybug outside just the other day and smiled for they have always made me happy in an unexpected way. I never knew their meaning and I thank you for letting me know. Good morning my friend! Oh dear, I am so, so late here...unfortunately, I have not seen any ladybugs because now I am in school. I see that you tried to connect with me the other day, and I was in a school meeting. I was unable to get back to you because by the time I got the message that you tried to reach me, it was too late. Off I run NOW to get an early start. No lady bugs for me; I am no longer playing in my garden, but rather, I have a new garden: OF STUDENTS. Maybe I'll discover I have a "ladybug" of a personality in my classes! And you can build shelters for labybugs in your garden so they live there and tend to your lovely flowers and plants. I haven't seen one for a while. I guess it's time to speed down and stop to smell the roses and enjoy the tiny and colorful wildlife that live in our gardens. PS - you are right about its association with Holy Mary: "Legend has it that crops in Europe during the Middle Ages were plagued by pests, so the farmers began praying to the Blessed Lady, the Virgin Mary. Soon, the farmers started seeing ladybugs in their fields, and the crops were miraculously saved from the pests. They associated their good fortune with the black and red beetles, and so began calling them lady beetles. In Germany, these insects go by the name Marienkafer, which means Mary beetles. The 7-spotted lady beetle is believed to be the first named for the Virgin Mary; the red color represents her cloak, and the black spots represent her sorrows." But just simply, because they are so cute. I haven't seen one since this spring but I love them! I'll think of "let go and let God" every time I see a ladybug now! And I remember the darling ladybug fabric dress I made my daughter when she was a little girl, hadn't thought of it in years! Hi Sheri, oh you captured a beautiful pic of the lady bug on your roses. My mother always said, Let Go, Let God. I haven't see any lately but I always take notice when I do. Thanks for sharing and have a great rest of the week and Happy September! Beautiful post and thanks for sharing!! I am glad to hear that your enjoyed my new series and thank you!! My ex-husband's niece was scared to death of them. Isn't that odd? I think they're adorable. I've always loved ladybugs, even as a child. I remember there was something special about the number of dots a ladybug has, but I can't remember what it was exactly. Maybe the number of dots represents the age of the ladybug? I think they only live for a very short time, right? Anyway, I see ladybugs fairly often, and they always make me smile. Happy Friday Sheri ,lovely Greets! I have not seen any, but I love your story about them and will look harder. :) I do love their cheerful presence in my garden. 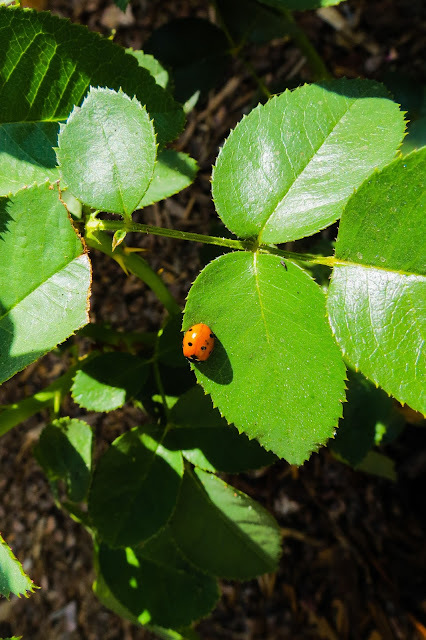 They like my rose bush because it is so often plagued with aphids, which ladybugs love to snack on.